We’re proud of our healthy history, and we’d love to share our accomplishments with you. Thinking about becoming a walker or a runner? 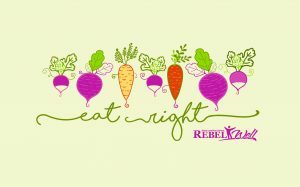 Considering running the RebelWell “Mighty Half” or 5K? Now is the time to start preparing! We’ll help you kick off this Happy New Year with tips on how to get started on your goal! Held in Turner Center 205. There are two chances to catch this seminar! Wednesday, January 13th at Noon or Wednesday, January 27th at 3PM. Join us Mondays thru Thursdays at Studio 125, 1st Floor Turner Center for Group Fitness Classes. Membership to the Turner Center is not required. You can use your Fall Semester pass or pick up a Spring Semester pass at the Fitness Center Desk (available January 4th). Classes are free for Turner Center members & $20 / semester for non-Turner Center members. Sign up at Campus Recreation, Turner Center 305 (662-915-5591). Beginning November 18th, activities begin! For each activity you attend you’ll earn Healthy Habits Participation Points. For each point you earn during the course of this Winter Challenge, your name will be entered into a drawing for one of our RebelWell New Year’s Fit Kit baskets. OPEN TO FACULTY, STAFF, & STUDENTS. Download and print off your Winter Challenge Log + Directions. Questions? Call 915-5431 or email rebelwell@olemiss.edu. Some studies show it can take 28 days to make or break a habit. RebelWell is challenging everyone to take 28 days from October 15 – November 12 to either QUIT a bad habit or COMMIT to a healthy habit. Participation in this challenge will earn you 50 Healthy Habits Participation Points! For more about our points program, see here. It doesn’t matter which you choose, but take this opportunity to challenge yourself to make a healthy change. Set your goal, stick to it each day, mark your log and evaluate how you feel at the end of the 28 day challenge. For each day you successfully quit or commit, your name will be entered in a drawing for prizes such as a FitBit, gift certificates, and more! Print out this log to fill out your activity every day. To submit your log, turn it in via campus mail to Kat Watson in Howry 112 (or scan and email to kwatson2@olemiss.edu) by noon on Friday, November 13th. Winners will be announced and notified by Monday, November 16th! Fall into Action with this year’s fall fitness challenge. September 1st – October 14th, stay active for 30 minutes out of your day. It doesn’t matter how, it just matters that you’re moving! Walk, run, garden, bike, swim…the possibilities are endless! For every day you log 30 minutes, your name will be entered into a drawing for prizes. 1st prize gets an I-Pad mini and runner-up prizes are gift certificates. You will also be eligible for 50 Healthy Habits Participation Points. Print out this log to fill out your activity every day. To submit your log, turn it in via campus mail to Kat Watson in Howry 112 (or scan and email to kwatson2@olemiss.edu) by noon on Thursday, October 15th. Winners will be announced and notified on Friday, October 16th! It is never too late to reap the benefits of strength exercises. Beginning-­‐level training will be demonstrated and led in a supportive, small group specifically for women over 40. The program includes pre and post fitness tests including strength, muscle thickness, bone density, body composition and balance tests. Commitment is the only cost. Treat Yourself to the Giﬅ of Wellness this Holiday Season! Registration cards available at each event. Each achievement focusing on fitness, nutrition, and balance, enters you into the raffle! Register for specific events below. Get a team of 2-5 members together for fun & support, or participate by yourself and be your own team. Make good eating decisions and add in physical activity most days during the holiday season. Try…30 minutes, 5 days a week! Weigh in at one of the 4 locations: 2015 Dates Coming Soon! Return to original location: 2016 Dates Coming Soon! The RebelWell Walking Challenge encourages UM faculty and staff to walk for 30 minutes each day. Each day that you reach the 30-minute goal, your name will be entered into a drawing to win gift cards and prizes, and five winners will be selected. One winning department (based on the highest percentage of people from the same department who participate) will be recognized and awarded a prize. In the event of rain, Wednesday’s walks will take place in the Tad Smith Coliseum. A list of 2014 participants and winners may be found here. Weight management can be a challenge for most people. With so many advertising messages and claims circulating, it’s hard to decipher what we really need to be eating. Sign up for this 12-week weight management course and learn the key components of eating healthy and how to manage your weight for life. Program includes: Weekly meetings with a registered dietitian, Individual consult with the dietitian, Personalized Meal Plan, Grocery Store Tour, Food Journal Reviews, Cooking Demos, Bod Pod Analysis. The course meets each Wednesday from 12-12:30pm in Lenoir Hall Room 101. Cost: $150. Payroll deduction option is available. Faculty/Staff: RebelWell will reimburse Faculty/Staff members $75 after successfully attending all 12 meetings during the course. Spaces are limited. Registration is required by noon September 16th. The University of Mississippi has signed up for the 2014 National Bike Challenge! The Challenge runs through September 30, 2014. We encourage faculty, staff, students, and community members to sign up for the Challenge and ride for our team! To learn more or Join the Challenge at: nationalbikechallenge.org. Click the “Join” button and become a new user, or join via your Facebook profile. You now have the chance to join as a University of Mississippi member. Although the challenge started in May, there’s plenty of time to log your rides and to set the stage for our participation in 2015. The Challenge has many great prizes, and each month prizes will be given away to reward Challenge participants. The more you bike, the better your chance of winning (and the better the prizes) will be! Click here to learn about the prize program. Showers are available at Minor Hall for bike challenge participants during the month of July for those who wish to take a mid-day ride. RebelQuest is a day camp for children age 6-13. Sessions are held on the Ole Miss campus and led by qualified University and community instructors. Each week stands alone for registration purposes. RebelWell is pleased to provide age-appropriate lectures, activities and field trips on nutrition and physical activity during Health and Fitness Week and Go Green! Week. Enrollment is limited to 40 per session. Rebel Quest is a great way to keep your child’s brain and body active throughout the summer without the pressure of traditional schoolwork. Visit RebelQuest’s website for more information or to register.